It’s hard to get a handle on Johannes Brahms the man. Variously described by his contemporaries as shy, prickly, loyal, shabby, generous, stingy, kind or distant, the only point of agreement seems to be that his was a very guarded personality, whose passions found expression in his music alone. So what would it have been like to have Herr Brahms himself rehearsing us? He’d be curt, gruff and impatient I imagine. Himself a relentless perfectionist, I guess he’d be unsparing of us performers. You’d get scant praise for doing it right; at best a grunt into the thicket of that commodious beard. The forty-odd of us would no doubt have slunk home feeling disconsolate and inadequate. And even fuller, such is the way of comfort eating, of the criminally delicious cakes. Abi, one might justly say, is unlike Brahms. Have we ever known anyone who so vividly enacted or embodied the music? (One can safely assume that Brahms did not trill, pirouette, bestride the stage or pluck extravagant analogies from the air). To watch her in action is entertainment of a high order. We are lucky to have Abi. Brahms is lucky to have Abi. Requiem-wise, we’re not there yet. It’s a work replete with opportunities for disaster and we were certainly a bit ragged here and there on Saturday. The lead changed hands quite a few times. Sometimes we crossed the line together. Some of us – I can speak only for the tenors – were often as not thrown at the first ditch. Everyone must have been exhausted at the finish, not least the indomitable Joy. No danger then that the nine or ten visitors would be inhibited by our perfection. (It speaks well of our approachability and the happy atmosphere that some will be joining us in the concert). The Singing Day was excellent. It helped to put more meaning into the music. I really think we have been blessed to have acquired Abi’s expertise. As others have done before her, I think she will lead us to new skills and musical adventures. 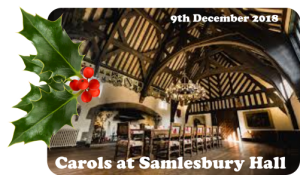 We hadn’t rehearsed, it was cramped (thirty or so of us under the Minstrels’ Gallery in the Great Hall), we could barely see Joy, we sang against the buzz and clatter of a restaurant in full swing and it was the happiest of events imaginable. We sang under the genial and indulgent direction of Rory Johnston – friend and colleague of Abi. The two dozen best-known carols in the canon. Where we didn’t know the harmonies we made them up. Beer was smuggled into the back row. Christmas cheer abounded and in that marvellous setting one irresistibly felt heir to a tradition going back centuries. It needed but a twinkling Mr. Pickwick, a hog on the spit and an infant to send up the chimney for Merrie England to be re-born before our very eyes . We can be very proud of this tribute to the fallen and its part in the climax to the town’s four years of WW1 remembrance. Karl Jenkins’ “The Armed Man” is justly revered for its haunting tunes and vivid picture-painting. It seems to respond to a deep need we have to comprehend, exorcise perhaps, the troubled history of the last century. We gave it our all and were rewarded with an exceptionally warm response. We share the honours with Gill Fourie and her Salesbury School choir – a very affecting performance involving giant poppies. They also brought in a significant share of a near-capacity audience. The Blackburn and Darwen Band accompanied us. It’s somewhat disconcerting to work with a brass band. After the intensity and duration of our own rehearsals, their seeming nonchalance just hours before the show is disconcerting. My neighbour Peter, noting the staggered arrival of bandsmen at rehearsal, was moved to wonder if they were a sort of flashmob. Of course they rose splendidly to the occasion as they inevitably do. Hearing their Finlandia at very close quarters is never to be forgotten. The Armed Man calls for two soloists. Rebecca Barry, a recent Royal Northern College of Music graduate. Her rendition of the sombre Kyrie was riveting. Click here to listen to Abi and John talking about Blackburn Music Society’s forthcoming events. 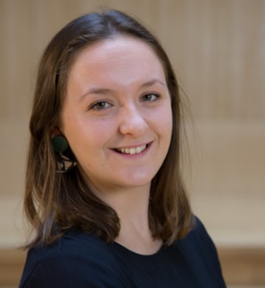 We were pleased to welcome our new Musical Director Abi Kitching and several new choir members as we began rehearsals of ‘The Armed Man’, Karl Jenkins’ inspirational anti-war composition, which looks forward in hope to the future. The dramatic music, with lyrics drawn from many parts of the world and from diverse religions and cultures makes this a work that everyone will enjoy learning and performing at the Remembrance Day concert on 10th November.